Length: 529mm. Image shows painted and assembled kit. 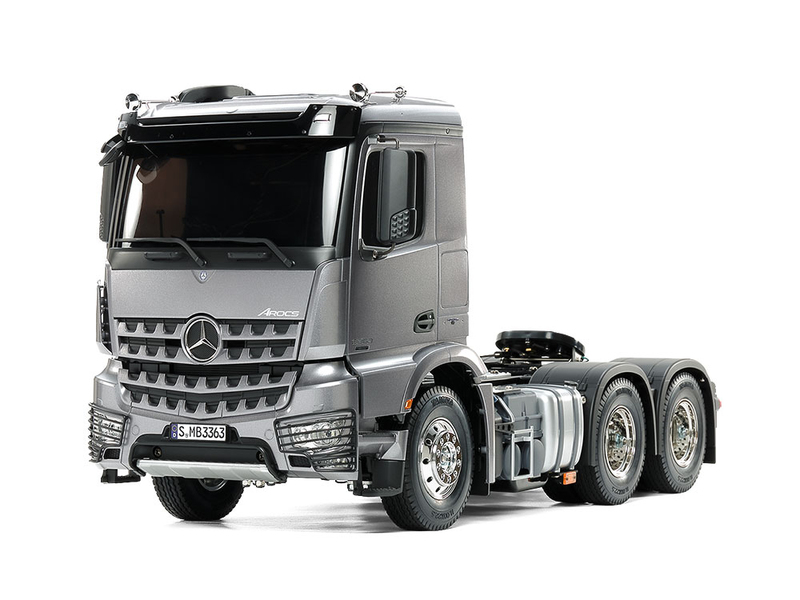 The Arocs series is a line of heavy-duty models introduced in 2013 by the world's leading truck manufacturer, Daimler AG (Germany). 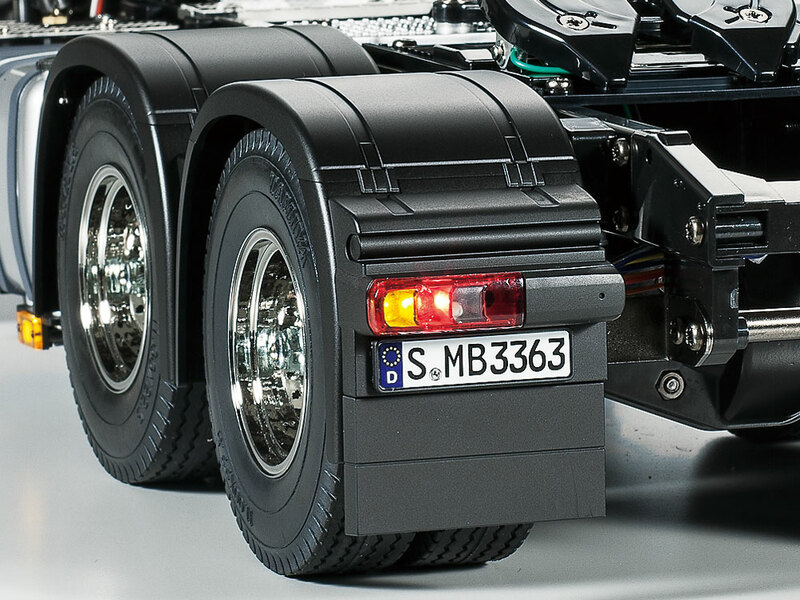 This R/C model assembly kit recreates the dual rear axle-driven Arocs 3363 6x4 ClassicSpace, which runs on a 15.6-liter turbocharged inline-6 engine capable of 630hp. The model has a realistic body, and a chassis featuring numerous metal parts. 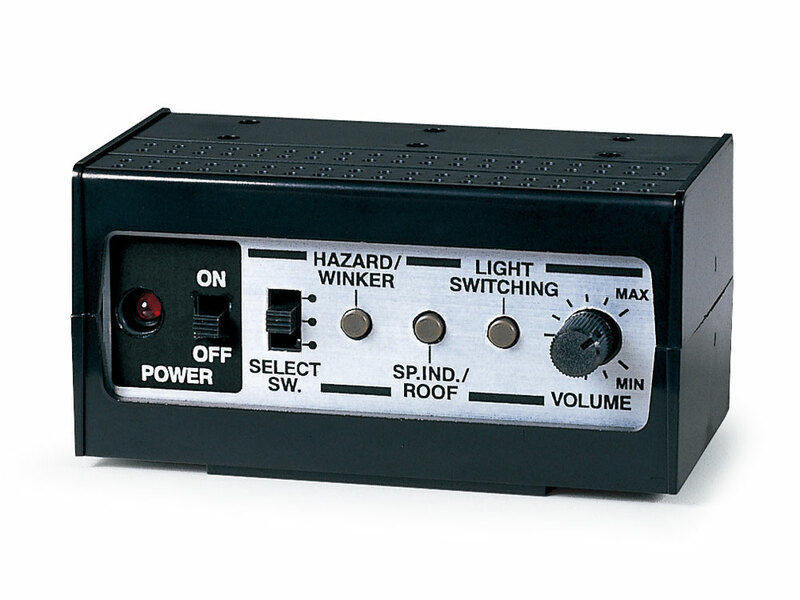 Gear changing is also possible via transmitter controls. Don't have the time, space or confidence to apply a paint job? Then this kit is for you - all body parts are pre-painted in a striking shade of light gun metal, with clear topcoat applied. Assemble, paint small parts in semi gloss black, and your body is ready for use! ★Cab parts come pre-painted in light gun metal. Components such as intake duct and various mirrors are recreated. 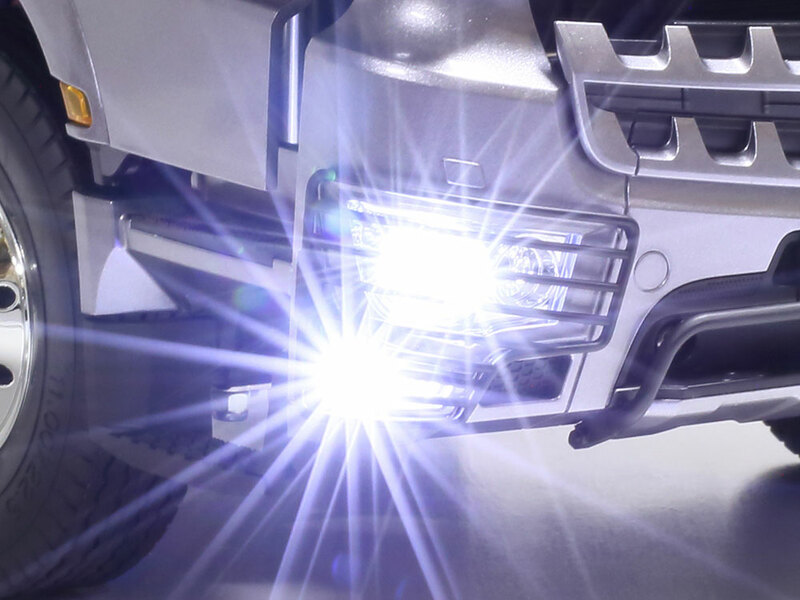 ★The front of the model will look great when lit up with LEDs and sporting distinctive headlight guards. 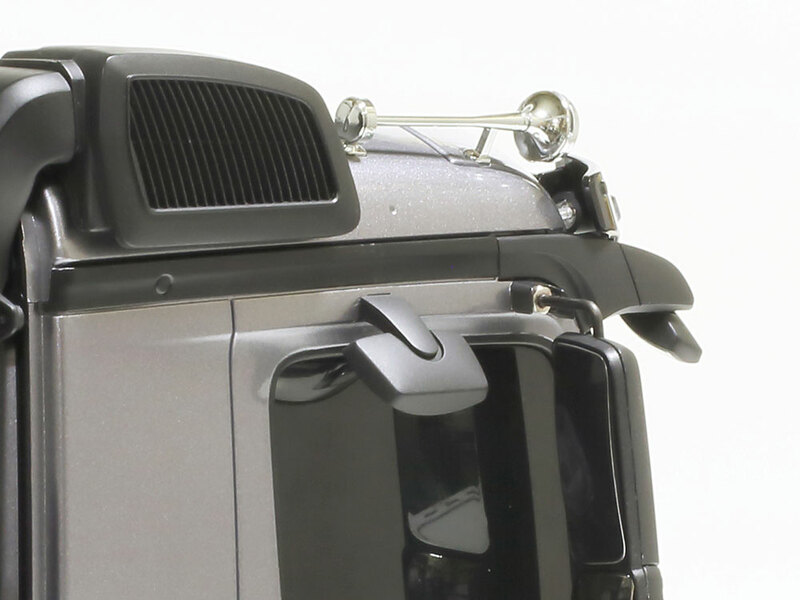 ★Stainless steel photo-etched parts add detail to the area behind the cab. Coupler allows attachment of trailers. 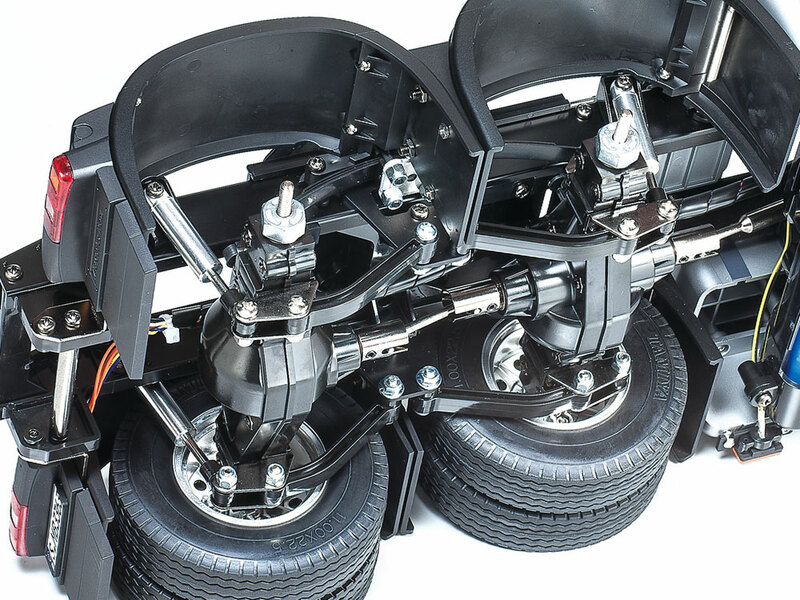 ★Left: Features an authentic suspension setup using reinforced resin rear axles and metal leaf springs. ★Right: Separately-sold MFC coordinates actions with lights, turn signals and more for superb realism. ★Left: Catalytic converter box houses separately-sold Multi-Function Control Unit, keeping the model's scale realism. 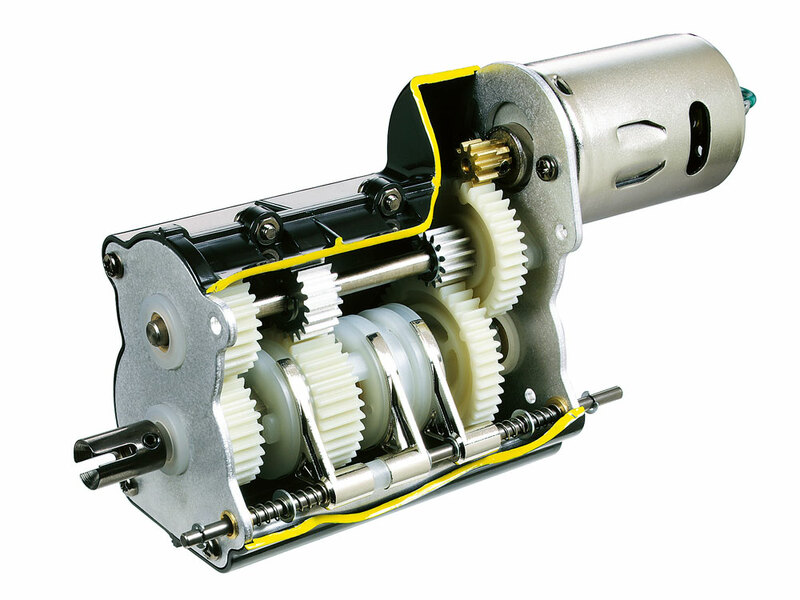 ★Right: 3-speed transmission allows gear changes on the move when used with a separately-sold 4ch transmitter. ●Length: 529mm, Width: 190mm, Height: 267mm, Weight (without optional parts): Approx. 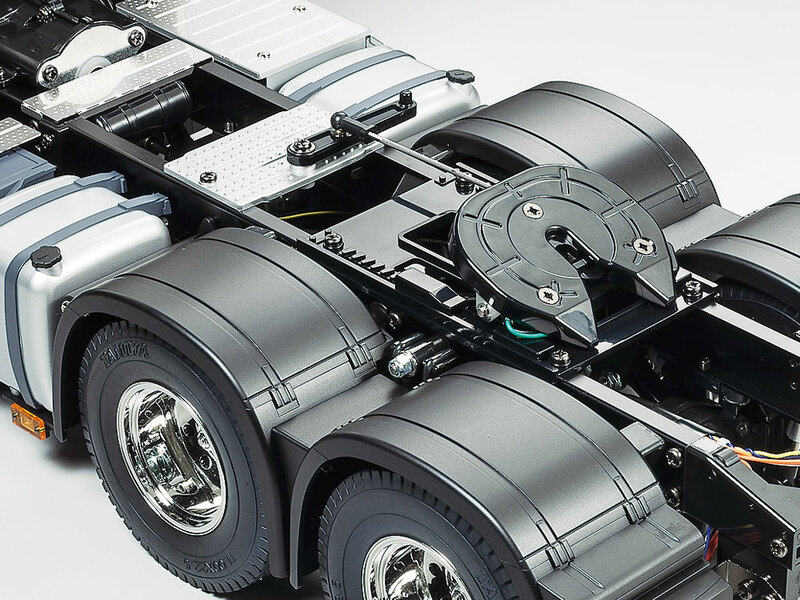 3.6kg ●Wheelbase: 237＋103mm ●Tread: 156mm (Front), 138mm (Rear, Double Tire) ●Chassis: Aluminum & Polycarbonate Resin Ladder Frame ●Suspension: Front/Rear Leaf Springs ●Caster Angle (Front/Rear): 0°/0° ●Camber Angle (Front/Rear): 0° ●Toe Angle: 0°(Front & Rear) ●Dampers: Aluminum Dummy Dampers (Front & Rear) ●Drivetrain: Rear Double Axle Drive　●Transmission: 3-gear transmission (gear shifting operated via transmitter) ●Gear Ratio: (1st Gear) 32.49:1, (2nd Gear) 17.76:1, (3rd Gear) 10.66:1 ●Diff. Gear: 3-bevel diff ●Motor: Type 540 ●Tire Width/Diameter: 22mm/83mm ●Requires four R6/AA/UM3 batteries for transmitter (sold separately). Information is correct as of February 25, 2019. Specifications are subject to change without notice.